"In so many ways I wish you could understand and then in other ways I hope you never really do. For if you do truly understand what its like to be "us" then that would mean that you must be one of "us". I'm not desiring one ounce of pity just a little bit of compassion and patience." It has been a long day! Most days are great! I am a very positive person and I truly love my life! But on days like today the above quote fits so well! Where I am tonight, is in a place that I NEED the world to understand! However I know they never will! I do not need this out of pitty... Not because I feel sorry for myself.. not to say oh poor me. I want people to understand what it is like to juggle everything. Not just the normal day to day stuff but all of the therapy, all of the delivery of Makenzie's supplies, all of the planing of her trips, doctor appointments, tube changes in the IR, emergency room visits for seemingly simple illnesses that last for hours on end.. most of which occur in the middle of the night, meetings about things you would never imagine, all of the dosing of her meds and the list goes on. Then there is the constant entertaining, as Makenzie can not play by herself. Although that is not really playing, actually; but more therapy! But wait, I have 3 other kids... you fill in the blanks! I want people to stop harassing me when I park in the handicapped spot because I don't look disabled before I even make it to the other side of the car to get Makenzie out. I just wish that everyone could truly understand what goes into every day for just basic survival before forming an opinion about my life. I just want to be able to close my eyes and imagine "normal" so that I can understand the way people think my life SHOULD be. 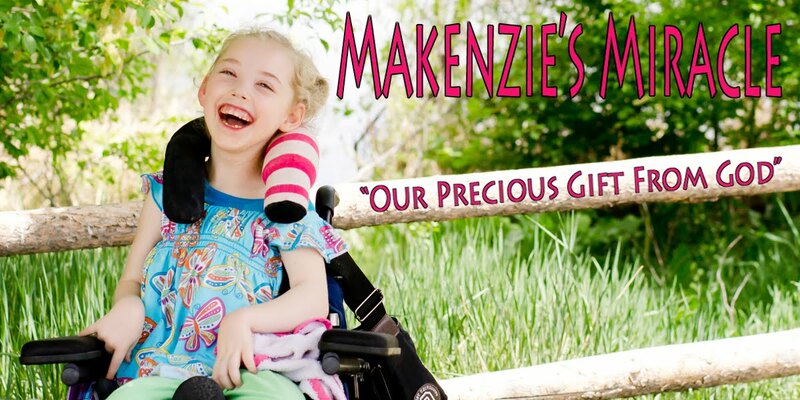 See there is nothing "normal" about life when something like Makenzie's accident happens to you. Regardless of the outcome. Every single part of ones life changes. Not all for the worse.... just different... very very different then most. I say all of this because I had a rough day. I say this because my face is burning from dried tears. I say this because I am tired. I say this because I have so many more uphill battles to come and I know this will not be the last day like today! I say this also because I don't want to be normal. I love my daughter. I love what she has taught me. I love where this journey is leading me. I love the people this "un normal" life has brought into my life. I love to feel so loved and blessed. You see I haven't missed the good things in life. No I haven't forgotten all of you out there that loved and support us! Nope sure haven't! I thank you all for that from the bottom of my heart because with out it Makenzie would NOT be where she is today and neither would I!!! I realize at the end of the day... after getting all of the e mails sent out, the reservations finished up, the checks in the mail, the errands run, and the long stressful conversations about things that are out of my control, I made it through today!!!! That one way or another I always do! That I am STRONG! That no matter how tall the mountain is, God will carry me up it and the reward is always GREAT! I do not know what God has up his sleeve for the rest of my life. Or why this life was given to me but I know it is going to be GREAT!!! So please... all I ask is for a little bit of compassion and patience! Infinite compassion and patience coming your way! You are an amazing woman and true example of a parent that would go to the ends of the earth for their child - literally! Now get some sleep you strong lady! You can't fight the world 24 hours a day! I truly understand. May tomorrow be a better day. I can say that I truly, and honestly, understand everything you wrote. I could have written it myself. Our journeys are SO similiar!!. My daughter reminds me of your daughter. Suzy was normal for 11 months - happy and healthy and full of life. But in a heartbeat she was taken from us. Suzy was replaced by a girl I have totally grown to love and cherish and to appreciate. But, I really miss my normal life, and my normal Suzy. I have 2 other children, and I understand how difficult it is to juggle it all. I'm not sure if you have ever 'heard' about us in the blogging world... but I have followed your journey for about 8 months. I keep makenzie and your family in my prayers. I love the new video of her rolling. We, too have received stem cells. We are going for our fourth treatment next week. Bless you, and have a nice week.